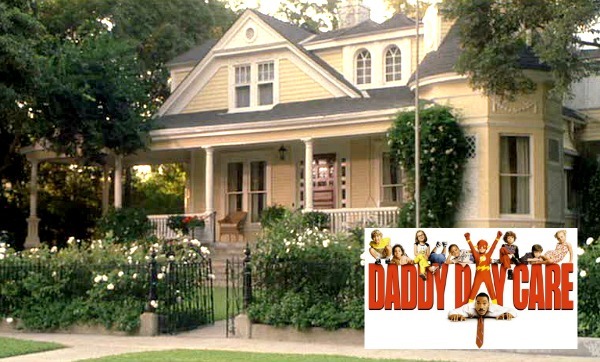 Eddie Murphy’s 2003 family movie Daddy Day Care grabbed my attention the minute it opened on this charming yellow house. It’s a real house in Pasadena, California, and has charm to spare. Let’s take a closer look! 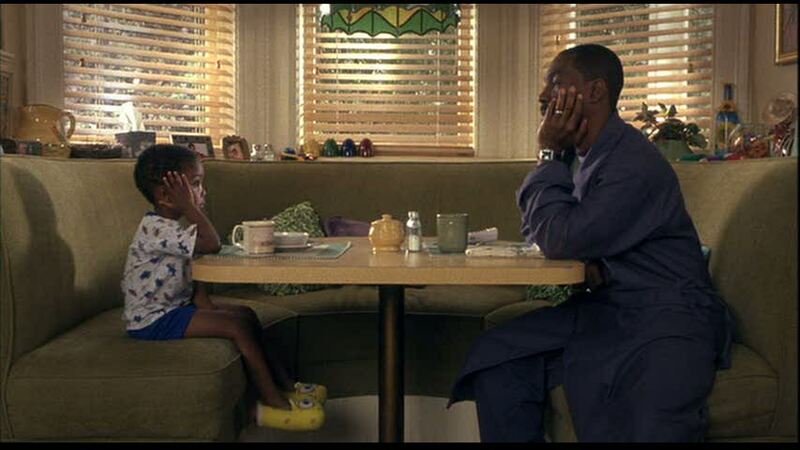 Eddie Murphy and Regina King play Charlie and Kim, a couple trying to make ends meet after he loses his job. 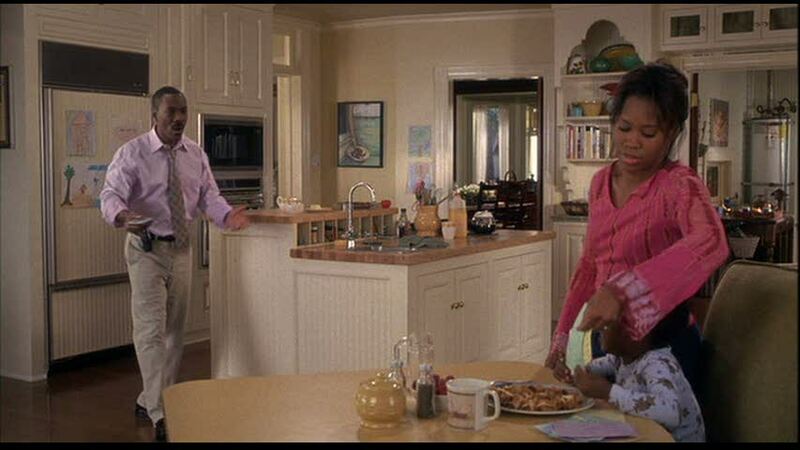 She goes back to work, leaving him to be a stay-at-home dad to their young son Ben (the adorable Khamani Griffin). 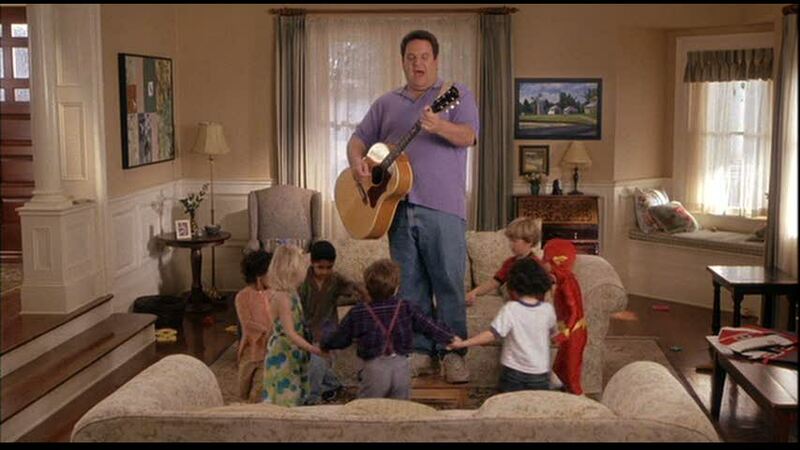 That’s when he comes up with the idea of starting an in-home day care. The movie also stars Jeff Garlin and Steve Zahn as Charlie’s partners in Daddy Day Care. The woodwork and built-ins are just amazing. One of my favorite rooms in the house. 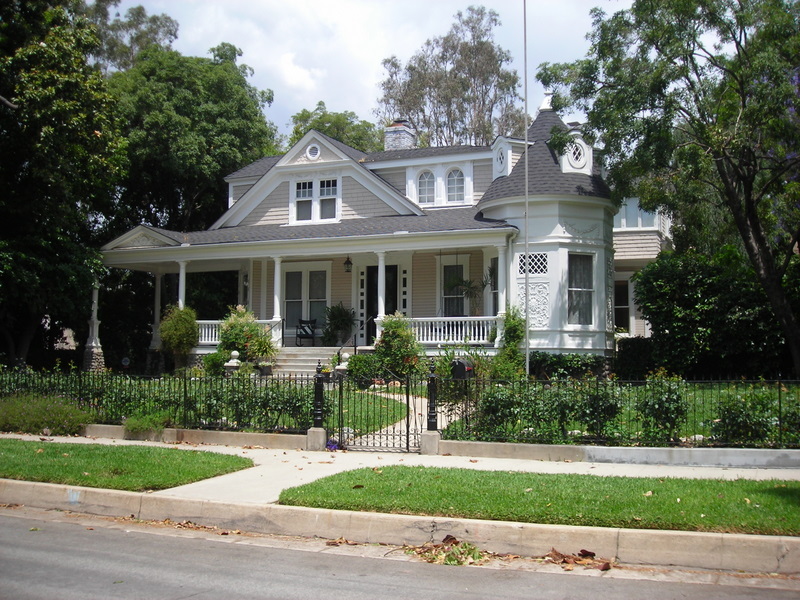 The actual house is located in Pasadena, as so many beautiful movie houses seem to be (Father of the Bride and Mr. and Mrs. Smith come to mind!). Interior scenes were most likely shot on a separate soundstage, however. Mary Haines' House in "The Women"
Pop Quiz: Can You Name These Famous Movie Fireplaces? .-= DJ´s last blog ..Twitter Fun =-. Great house, but I would love to redecorate it. A few children’s movies that I recall for the houses are “Hook” and “Mrs. Doubtfire”, and, from my own childhood, “Mary Poppins” and “Summer Magic”. Love the banquette breakfast nook and the green tile countertops in the kitchen. In fact, I love all of the green in this house, especially Ben’s bedroom. My favorite kid movie house was Dennis the Menace. This was such a beautiful yellow home. I like the outside better than the “inside” set. Looks like it would be much more charming on the actual inside. .-= Becky @ Farmgirl Paints´s last blog ..It’s all good! =-. Lovely house (how was the movie?). The living room reminds me of “Risky Business.” Happy Monday! .-= Sheila´s last blog ..A lie is a lie is a lie: barefaced vs. bald-faced vs. bold-faced =-. Beautiful bones….but miss the “messy, lived-in” look of Nora Ephron films! .-= Melanie´s last blog ..A girl, a camera, a class, & Karen Russell. =-. I love this house! Driving around in Pasadena is a feast for a house lovers eyes. I would just love to go inside so many of the lovely homes there! I love the turret room..I can just image a cup of tea, a cozy chair and a favorite book…ahhhh. .-= Pat´s last blog ..HE IS RISEN ~ AND HE LIVES FOREVER MORE! =-. What a beautiful house! I love that wallpaper in the master bedroom and the woodwork in the dining room. Great house! .-= Michelle´s last blog ..Here Comes Peter Cottontail… =-. Oh, I’d forgotten how much I loved that house! So glad someone suggested it. 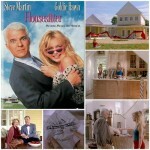 I remember I rented that movie and watched it over several times just to look at the house! 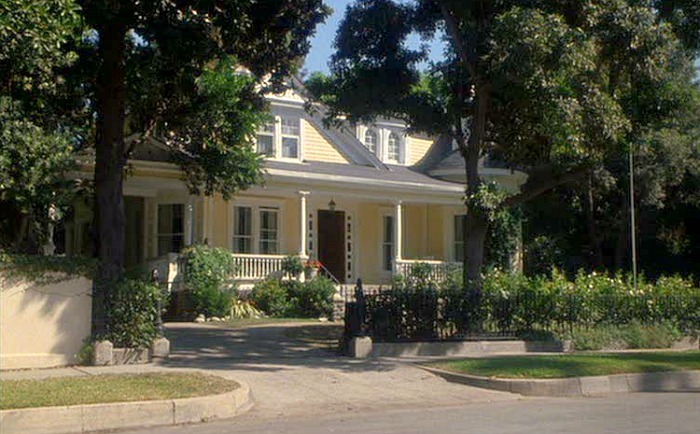 The Father of the Bride house is in San Marino near Pasadena. This yellow house is a Queen Anne Victorian cottage. I am now writing history columns on historic houses in Riverside and San Bernardino Counties for my newspaper! I love it. PD; last bur not least “The Parent trap”!!! Yellow houses are so friendly! I wanted to paint our house yellow, but the entire cul de sac has houses in shades beige, tan, taupe, etc. It would have been out of place. Like everyone else, I really like the house, especially the breakfast nook (grew up with one of them), but would want to redecorate. Isn’t that coffee table a little large to fit between those sofas? .-= Black Eyed Susans Kitchen´s last blog ..WHEN YOU WALK…WHERE DO YOU LOOK? =-. I do so LOVE this house. And, I have a daycare in my home. Why, I could just move right in!! .-= Catherine´s last blog ..Woman’s Best Friend =-. Love this house! So beautiful. And the dining room built ins are amazing. If those are sets, they’re really well done. It really feels like the inside of the house. Nice! .-= Lesley @ TheDesignFile´s last blog ..Giveaway: A chalkboard decal for you or the kids! =-. I never saw the movie but this house is amazing. Love the turret. .-= Amy´s last blog ..I’m Back…Again =-. what i want to know is what style is the house is this considered a tudor house or a victorian style house what ever style it is I have to know so that I can start looking for it I simply loove this yellow house. 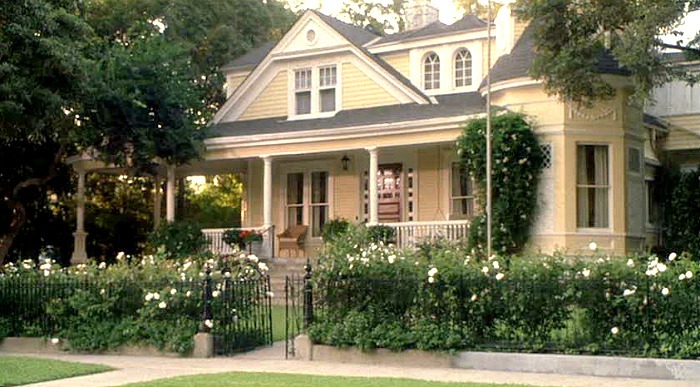 I love the houses and apartment from Cheaper by the Dozen (the Bonnie Hunt/Steve Martin one). i has a slide that goes all the way from the turret to the outside! How awesome would that be?! Great house! I especially love that porch!! .-= Vicki Jacoby´s last blog ..Movie Monday!! =-. For some reason one story Queen Anne Cottages with turrets, look like the top story of a multi-story house was cut off and placed on the ground. Amazing house! My favorites are the breakfast nook and Ben’s room. Lucky little man to have a huge room like that. Although if I was him I would spend most of my time in that little nook. I loved little hideaways when I was little that would have been the perfect spot to curl up with a book or have very serious conversations with my teddy bears. Too funny. My daughter and a friend were watching this over the weekend and I wondered if you had ever done a post on this house and here it is. Love the yellow exterior. .-= Vanessa´s last blog ..Happy Easter Weekend + One of a Kind Spring Show =-. Something about photos four and five reminded me of the Meryl Streep, William Hurt film One True Thing. Have you ever featured that house? I was hoping you were going to do this post. I love this house. That wallpaper wouldn’t bother me because it’s light colored and you can barely see it. I love how old homes have built-ins and backboards. I would love to have my own turret sitting room. I would go sit up there and never want to come down. 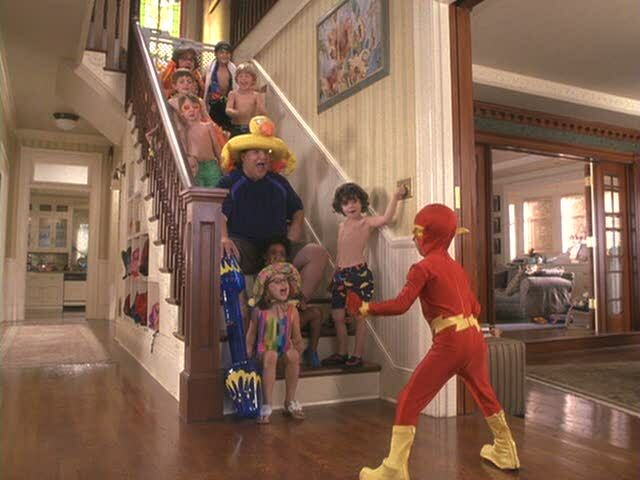 There’s so many kid movies I like with houses in them. 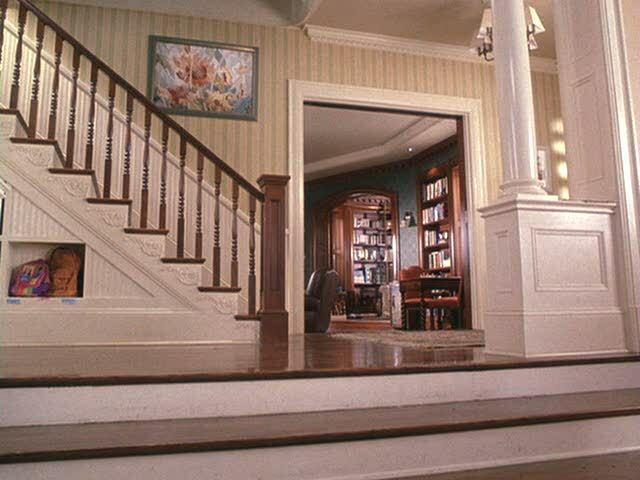 I love the three story house in the movie Matilda. This isn’t really a kid’s movie, but the Unsinkable Molly Brown mansion. The Swiss Family Robinson tree houses, the homes from the new and old Cheaper by the dozen movies, It Takes Two mansion, the Jumanji mansion, Beethoven house, the old Yours Mine and Ours Victorian home, and Mrs. Doubtfire Victorian home. 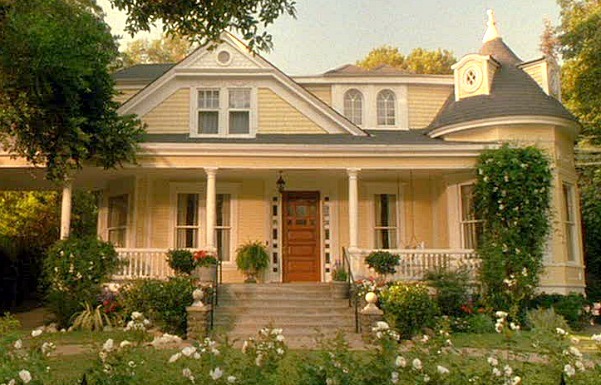 The old Cheaper by the Dozen home is the same exterior used in the movie Meet Me in St. Louis, but the inside is totally different. As you can see, I love watching old kid movies. I could watch them over and over again. Too bad they don’t make anymore cute kid movies. Now all we get is animated movies. .-= Kim´s last blog ..These were once in style? =-. Yet another movie I have not seen. I don’t know if I can get the husband to watch this one. 🙂 Maybe I’ll get lucky and catch it on TBS. Really cool house. .-= Nichole´s last blog ..The Rundown =-. I actually think this movie is hilarious. My kids wanted to check it out from the library last week to watch again. They love it. .-= Carmen´s last blog ..Easter Menu =-. I remember that movie, it was so funny! My favorite part of the house is the window seat in the living room. I’ve always wanted a window seat. .-= Jenny´s last blog ..Happy Easter =-. Indy looooooves this movie. Loves it. He watches it as often as I’ll let him. Sometimes I don’t mind because I love the house so. It’s gorgeous. The turret room makes me swoon. .-= Mom in High Heels´s last blog ..RTT: Easter and other nonsense =-. great great great – love it to bits! .-= Annie@A View on Design´s last blog ..The Lindrum 58 =-. I haven’t seen the full movie either, Julia. The house is gorgeous though. I love the kitchen and the turret area ~ what a great spot to have a library with floor to ceiling books! YEAH!!!! I love, love, LOVE this house!! I’m so excited you did this!! It is seriously one of the most gorgeous houses I’ve ever seen!! Great Job!! I think you are just my most favorite person today! I will be looking at this pics all day now. I just love Ben’s room how it has that extra little section to it!! LOVE IT!! Thank you!! 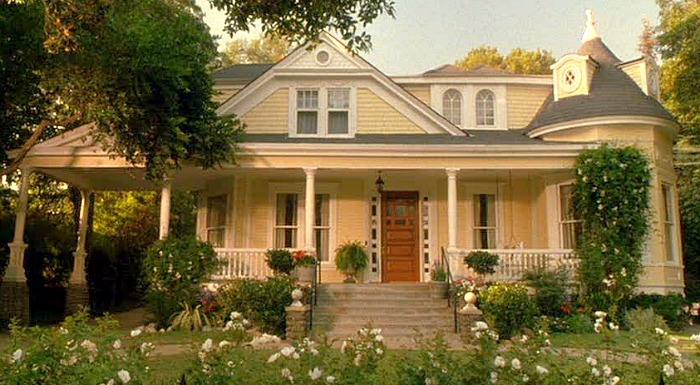 Some other movies, not really a kid’s movie, but I love the little house in “Jerry Maguire”…and, the backyard. Another old fave is “The Egg and I” from the ’40s…love how Claudette Colbert turns a shack into a cute farm cottage…I think I like cozy & cute more than anything. Hi, I am wanting to build the Daddy Day Care yellow house for my parents, very deserving and have always wanted a home like this. Do you have the house plan or do u know where i can find it. I loved this house rented the movie several times so i could model it inside and out, even though the inside might have been a sound stage. 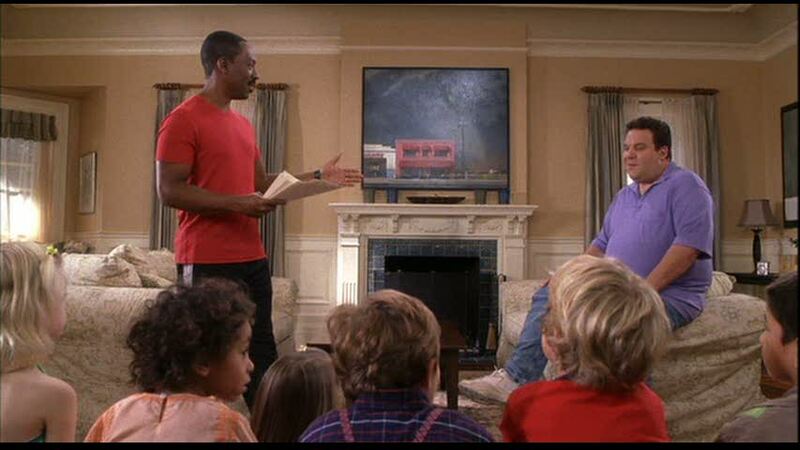 I love all the fine art in the movie Daddy Day Care. I live the paintings throughout the house! The one in the liv room has inspired me to paint one similar. It is the one above the fireplace. If anyone wants some custom oil paintings, let me know? 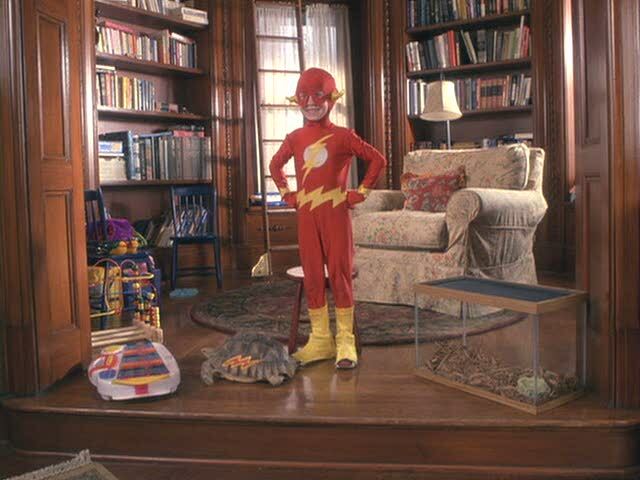 I remember watching scenes from this movie over and over just to see the house. Thanks…at least I now know I’m not the only one! Have you thought of including the house in the Vin Diesel movie “The Pacifier”? P.S. I love this site – I’m so pleased I’m not the only one who is inspired by the houses in movies. I love the movie Anne of Green Gables. 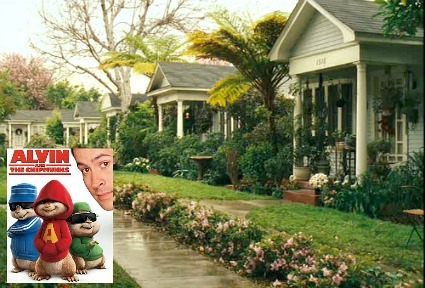 There are many beautiful homes in that movie! Have you seen the house from the movie Matilda? Beautiful. I was just wondering, do you know where exactly this home is loacted? I assume in the USA. Can you actually go and see it it?